Thousands of golf fans enjoyed an exciting Masters - in which Ireland’s Paul Dunne held off Rory McIlroy to clinch his first European Tour title - thanks to Go North East teeing up a first class transport link. The region’s largest bus operator, Go North East, shuttled around 2,500 spectators back and forth between Newcastle city and Close House, Heddon-on-the-Wall, to catch the 2017 Masters action between 27 September and 1 October 2017. With bursts of wild weather to negotiate, a team of 30 Go North East team members delivered the convenient and speedy service. Some passengers made the 12-mile trip on the award-winning company’s brand new double-decker buses used on its X9/X10 route. With Euro 6 engines to reduce harmful emissions while providing a smoother journey, the vehicles also have comfortable leather seats, USB power sockets, on-board wifi and audio-visual next stop announcements. For the entertainment of passengers, the upper deck of the vehicles also feature gaming tables, including popular casino favourites and snakes and ladders. With the North East venue selected by tournament host and Ryder Cup legend Lee Westwood, it is the first time a European Tour tournament has been held at Close House, and the first time in 45 years that a European Tour event has taken place in the region. Demand for tickets to the Masters was unprecedented and an estimated 60,000 headed to the Northumberland course to support the tournament. It is hoped the smooth running of the event could pave the way for more major sporting competitions to be considered in the region. 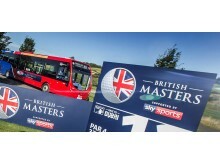 Rory Colville, Championship Director of the British Masters supported by Sky Sports said: “It has been fantastic to work with Go North East as our local transport partner. With the huge numbers of attendees, it’s incredibly important that everything is highly co-ordinated and means minimal disruption both in and around Newcastle city centre and the Close House local area.